Note: This post is my first audio post. You can listen to the audio version at the end of the post. In the near future, you'll be able to access this and other audio posts, along with the All Freelance Writing Podcast, by visiting FreelanceTheater.com. Lately I've been chatting with KeriLynn Engel about her freelance writing business, and the issue of anxiety came up -- specifically client call anxiety. Before taking a call from a potential client, she gets nervous. She gets so nervous, in fact, that it can interfere with her other work leading up to those calls. KeriLynn wanted to know if there were things she could do to minimize that if she continues taking client calls instead of going email-only. Here's some news for you: I get nervous before taking calls from freelance writing prospects too. That's coming from someone who has been doing this for a long time, who has a background in PR (even pursuing a minor directly in speech communication back in college), and who loves public speaking (though that scares the hell out of me too until I get started). It's natural to feel a bit nervous or anxious before taking business calls, especially when you still don't know the other party well. With prospects specifically, my best guess is that it ties into another common fear freelance writers talk about -- the fear of selling themselves. And having to do that, with a stranger, over the phone can make you feel vulnerable. I get it. As solo professionals, it's easy to associate sales efforts with self-worth (though you shouldn't). Thankfully, there are some simple things you can do to take the edge off. They won't eliminate all anxiety around client calls, but they can stop that anxiety from ruining the rest of your work day. 1. Schedule calls at the beginning of your work day. If your anxiety builds throughout the day as you wait on a client's call, you're not going to be able to put 100% into other work earlier that day. So schedule calls as early as possible and get them out of the way. Allow yourself only enough time to prepare, not enough time to panic. 2. Take control over call initiation. 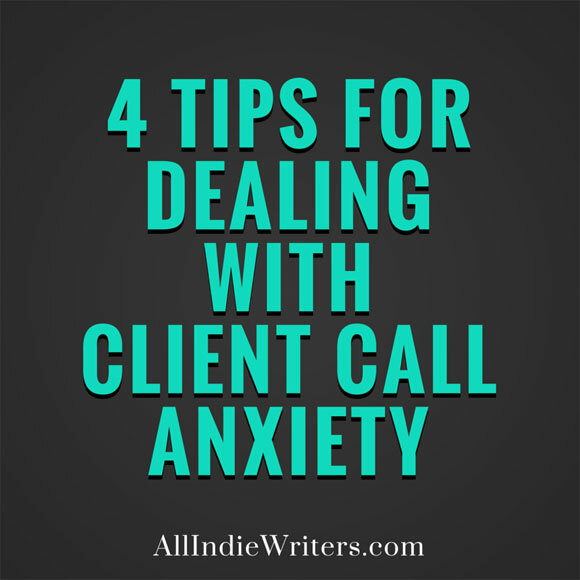 If you tend to get nervous while you wait on a client to call you, even getting a bit jittery while you wait for the phone to ring, stop waiting. When you schedule calls, get the prospect's or client's phone number and tell them that you'll call them. You don't need to control the conversation. But being able to control something as simple as initiating the call can cut down on the wait-related stress. 3. Limit your call availability. Your overall phone availability will depend on the type of writing you do. If calls are the norm, you'll probably have to be available for them more than other writers. But if, like me, you work with a lot of online business owners or overseas clients in different time zones, chances are good they'll be open to working with you via email instead. When you do take calls, consider limiting them to specific times during the week. For example, you might take calls only during two out of your five working days. Or you might only take calls during specific hours, keeping your phone off during your scheduled writing time. Sure, you might make occasional exceptions. But most of the time you'll know when your "safe times" are -- periods where you can concentrate on other work without worrying about phone calls coming through. 4. Group scheduled calls together. Whenever possible, try to schedule client or prospect calls in succession. How does this help with phone-related anxiety? It cuts down on the amount of time you can stress over individual calls. Plus, once you get "warmed up" with one call that goes well, you'll probably find that you have an easier time moving on to your others. Think of it as a simple confidence booster. No other calls scheduled? Consider setting up a call with a colleague, friend, or family member leading into your client calls. You'll still move more seamlessly into your next call, and talking to someone you know well might also help boost your confidence by helping you cut back on some of the stress. Look. Nerves sometimes get the better of us. And for some freelancers anxiety is a serious issue. While these tips won't completely eliminate the fear you might have surrounding client calls, like I mentioned earlier, they can help you take the edge off. Sometimes that's all you need to build (or fake) a bit of confidence, make a great impression, and land a new freelance writing gig. Have you ever dealt with anxiety around client phone calls? How do you deal with it? Share your tips and experiences in the comments. Thanks so much for tackling this topic, Jenn! I think it’s one that a LOT of writers deal with. Love these tips! I have noticed that scheduling calls earlier in the day definitely helps, since I’m not anxious about it the whole day. But it never occurred to me to call the client, instead of waiting for the client/prospect to call. That’ll help me out a lot, I think. I agree that getting the phone call over with early in the day is very helpful. But as an extreme phone-phobic, I’ve found that doing some safe “warm-ups” before the nerve-wracking call helps most. I do some small communications-oriented tasks first. Sending two or three emails, followed by making a phone call to chat casually with someone “safe” – calling my spouse to talk about the grocery list, a friend to arrange an outing, etc., eases me into the difficult call. Love this, particularly the idea of getting them all out of the way at once. Even tho’ I’m not phobic, I like clearing the decks so I can write as it were.